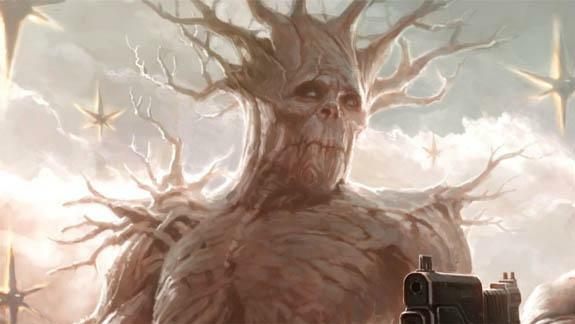 Vin Diesel was recently in talks with Marvel, but what was talked about was only speculation until Diesel briefly posted a picture of Groot from Guardians of the Galaxy on his Facebook page. Who is Groot? He’s the massive, bodybuilder alien on the team. Okay, not really. That’s Drax the Destroyer, who is being played by Dave Bautista. Groot is a huge, tree-like being. As you’d expect, one of his powers is to control trees. And with his lumbering size, he has enhanced strength. But what’s not expected is that he is resistant to fire. We should look forward to Diesel wearing bark on set, by which I mean he’s doing voice work for the role. It’s exciting, really. The man has done an excellent job in the past with The Iron Giant. I’m looking forward to Diesel proclaiming, “I am Groot”. Guardians of the Galaxy releases in theaters August 1, 2014.